27/28/39/DT Medium Duty Series Available at Casters of Amarillo, Inc.
27/28/39/DT Medium Duty Series includes some of the most recognized and commonly used casters in a wide range of industries. Made from 1/4” thick cold rolled steel, they are designed, formed, and welded for optimal mobility, which makes them some of our most popular selling casters. Made to withstand the typical rigors and abuses of medium duty caster applications, standard features include double ball raceways as well as a 5/8” nut and bolt kingpin. 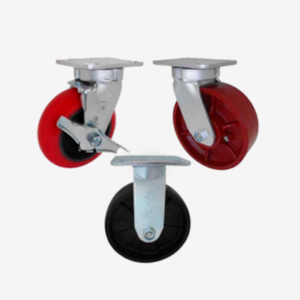 These casters also come in numerous different wheel types, bearings, and brake options. Apply grease by zerks in the raceway as well as the axle. Popular applications include various carts, trucks, dollies, racks, and equipment for almost every industry.